fluffy tail help Zogby fit in? Or can Zogby find a way to stand out and still keep his job? With her birthday coming up, Ana asks Abuela Lola for tickets to the amusement park. Instead, Abuela Lola sends...a chicken. But this ingenious chicken may turn out to be the Best Present Ever! Click here for more information or to order your copy today. Click here for more information, or to order your copy today. A man walks into a store to buy a pillow...and walks out with a new best friend. Lila wants a special job to get ready for Shabbat, just like her big sisters Rachel and Naomi. But every time Lila tries to help, she ends up making a gigantic mess. Can Lila find the perfect way to help her family? Out now in picture book and board book formats! Peep is so excited to go trick or treating with Egg. But Egg is NOT trick or treating. No way, no how. With monsters, mummies, and witches lurking, it is way too scary out there. Can Peep find a way to convince Egg that trick or treating is not so scary with a big sister by your side? Egg is not ready to hatch. No way, no how. 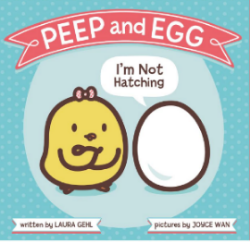 Can big sister Peep help Egg break out of her shell? Click here for more information or to order your copy today! Add ONE big pair of underwear to TWO big bears who hate to share, and what do you get? A little math, and a lot of laughs! Click here for more information, or to order your copy today! Hare is sooo much faster than his best friend Tortoise. And he is ready to prove it, in a race all the way from Tel Aviv to the Dead Sea.